I've been looking for a dock for my Hobie. All of the manufactured floating docks didn't fit and support my Hobie properly. And, I wanted to remove the dock for winter. After much searching I found this floating party pad made by O'Brien. It's called the Deluxe Water Carpet. It cost significantly less than a commercial dock. The pad will support almost a 1,000 pounds. I added a couple more grommet holes to the pad and crimped stainless braided cable loops through the grommet holes. I lock these cable loops to the dock. The loops hold their shape and keep the pad from rubbing on the dock. 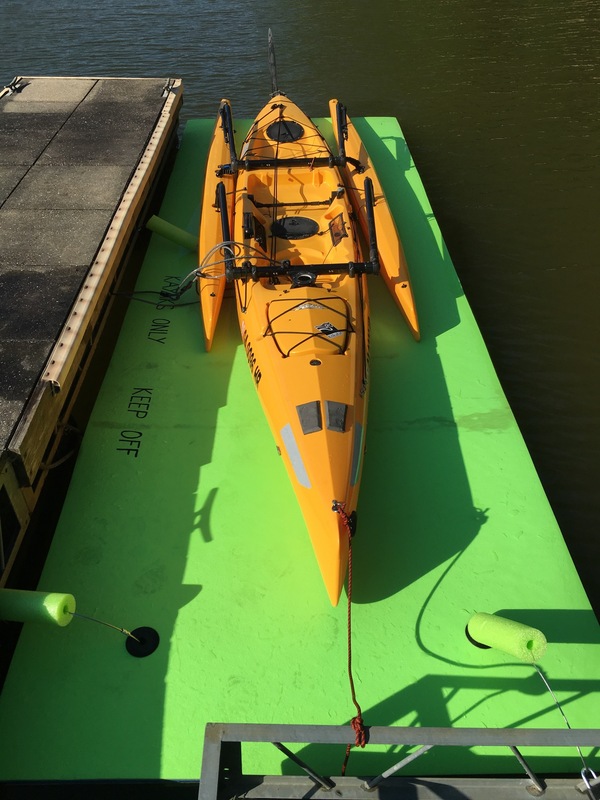 As you can see, the pad holds the Hobie completely out of the water. I also lock the Hobie to the dock. This should keep the honest folks in line. I can walk on the pad to launch or store the boat. It also makes it very easy to load gear and passengers. At the end of the season I will roll it up and put it in the garage. It weighs about 60 pounds and is easily transported on my kayak cart. I've see several post regarding storing a Hobie so I thought I would add my two cents. Hope my pictures post properly! That's awesome, thanks for sharing. 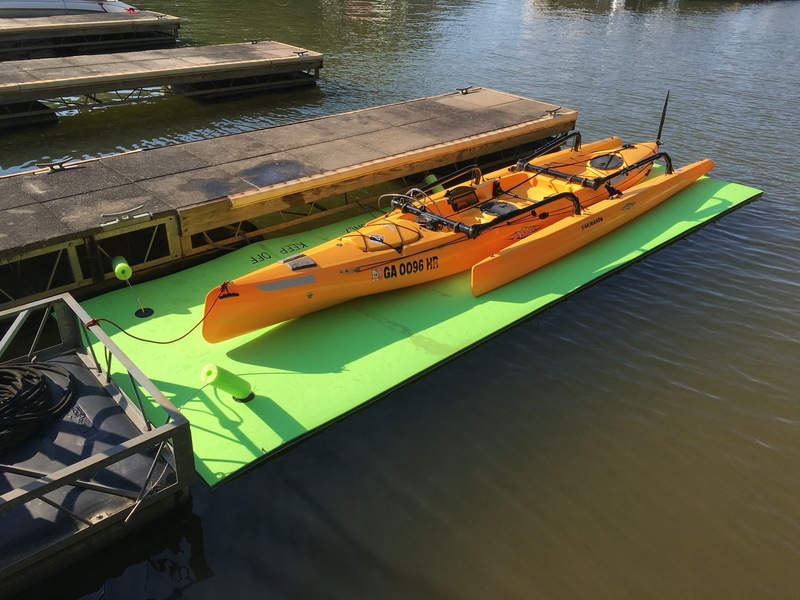 How do you get the kayak off or on the pad without getting wet??? Are you happy that it is secure from theft? I see there is just a metal cord running through the scupper holes? Now that is something completely different! What a great idea Yakmandu. I've never seen anything like it. Interested to see how it goes long term. Have you considered some sort of cover for sun protection? I'd be concerned about long term UV damage. This is great! I've seen some of these floating platforms and have wondered if they'd work... I am in open salt water, occasionally rough. Your photos look quite calm... How has it held up, does it get rough? I'd love to hear back. I just tried a lightweight sand screw and tethering mine in the water to dock on stern and sandscrew aft -- well I had to hunt it down in neighbors yard this AM. Of course I was thanking the wind gods that she still here. What is are the grey foam pads on the bow for? How many miles from your dock down to the dam? 1) I pedal the Hobie onto the dock using my Mirage. With a little speed, I can land it up to the Mirage drive. I then pull the drive, climb out the front, and pull it the rest of the way onto the dock. I can walk on the dock. In the middle I sink about ankle deep, at the edges I sink down to my knees. It is actually very stable to walk on. 2) I have the floating dock locked to the marina dock using three separate stainless braided, crimped loops. I lock them to the dock with padlocks. I have a separate braided lock that I use to lock the Hobie to the dock through the Mirage drive hole. It won't stop a evildoer with cable cutters, but it works for someone just walking by looking for a joy ride or wanting to "set it free!" 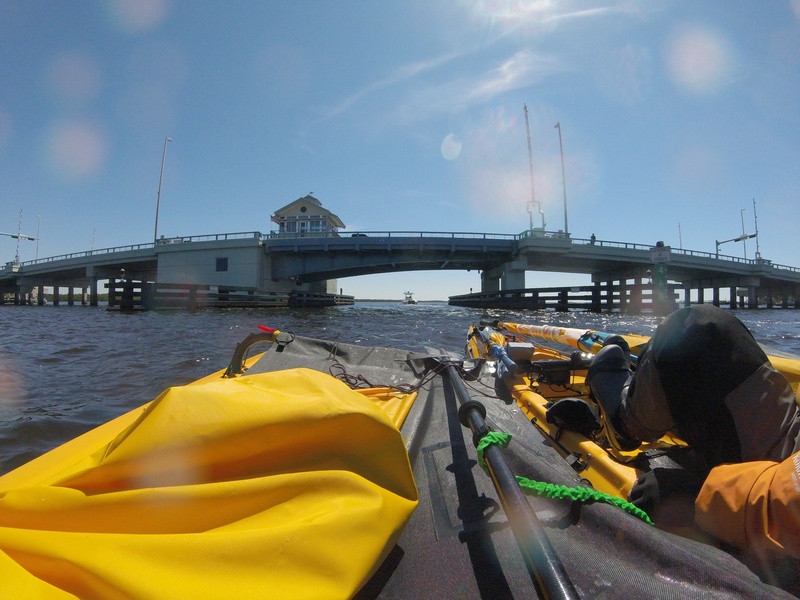 3) I keep the Hobie on the dock when weather and wind is promising, usually a few days at a time. The Hobie shares dock time with my kayak. If I decide to keep it out in the sun more, I will definitely invest in a cover for it. 4) The dock is in a protected floating marina. So far I haven't had any problems with waves causing damage to the dock or Hobie. The stainless braided loops are quite stiff and keep it away from the marina dock. 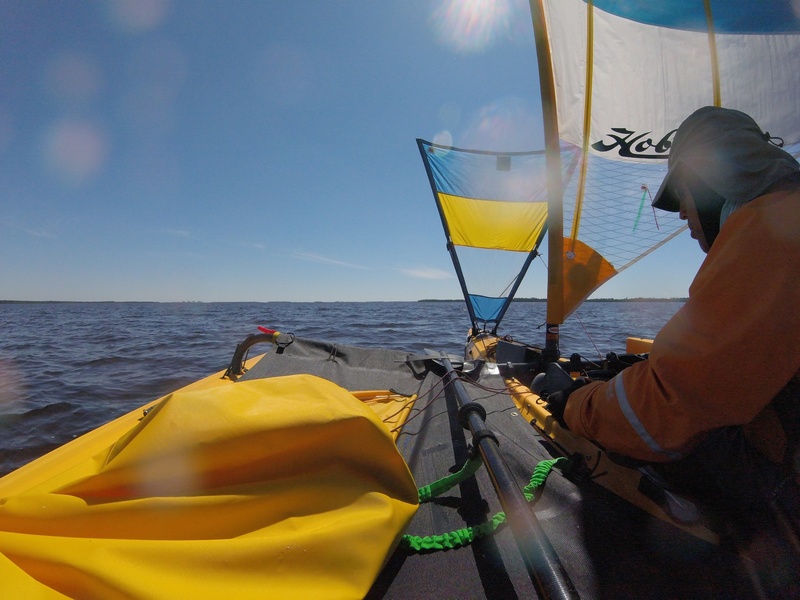 5) The foam pads on the bow of the Hobie are for my Pacific Action Sail (PAS). 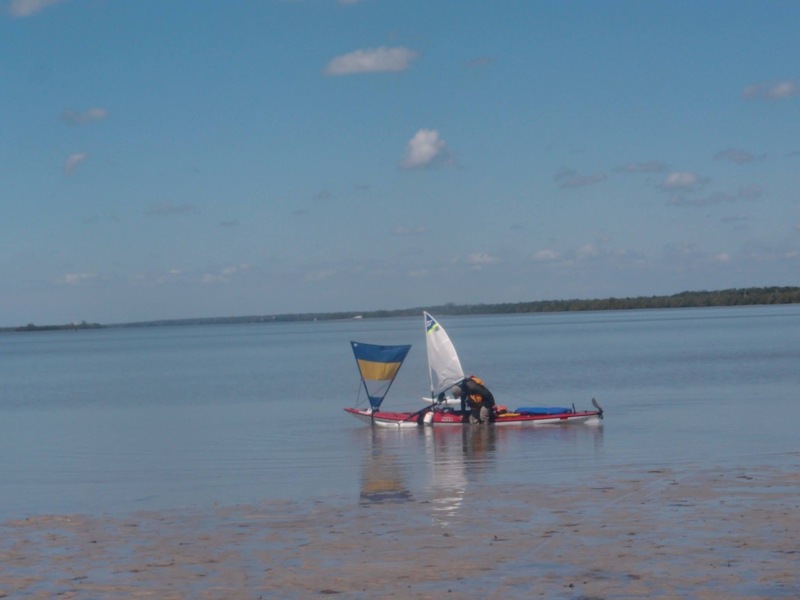 It is a one meter sail from my kayak that I use for a little extra downwind boost. It also works with a beam wind. I really like my PAS and it works a lot like a jib. It is simple to operate and doesn't interfere with my mainsail. The lines for the PAS run to cleats mounted under and aft of the front akas. I can douse the sail from my seat very quickly. Thanks for the interest in my dock solution. I really enjoy reading about everyone's Hobie trials and tribulations! If you have time, I would love to see a photo or two of your PAS set up. Here are a couple of pics of my PAS installed on my 2015 AI during this year's Everglades Challenge. It stows easily and does not interfere with my mainsail. The only time I don't use it is when I am close hauled. I am definitely faster than a stock AI with the PAS. One tip... Be sure to lash the PAS when it is stowed. Otherwise the sail can fill with water while laying on the deck and cause the front end to dive. Thanks for that, looks like a nice setup. What was the reason you went with the 1 metre sail over the 1.5 and 2.2 metre versions? I bought the 1 meter to meet Watertribe's class one requirements a few years ago. I used on my Necky in three Watertribe events before moving to the AI. Paddling took a toll on my shoulders. Those Mirage drives looked very appealing! I would measure the length of the larger PAS sails to make sure they don't encroach on the AI and/or TI cockpit when stowed. I sailed with a experienced EC and TX200 sailor recently that uses a PAS 1sqm sail on his tandem and he swore that it was a noticeable improvement in downwind AND upwind performance. Seem like this may be a better solution than a jib because it would be very compatable with adding the spin at a future date. These are easier to deploy and bring down than a jib, can be taken off and on easily and require less rigging. He said to be careful and get the 1 sqm size based on the size of the bow of a TI. Last edited by vetgam on Fri Jun 24, 2016 5:02 pm, edited 1 time in total. Seem like this may be a better solution than a jib because it would be very comparable with adding the spin at a future date. I'm surprised that Hobie hasn't adopted this as a Hobie branded accessory as they have with other products.